Clean mushrooms, keeping colors separate, and trim tough stems. (Save stems for stock.) Slice mushrooms about 1/8-inch thick.In a wide skillet, warm 2 tablespoons olive oil over medium high heat. Add onion, season with salt and pepper and cook, stirring, until onion has softened and browned, about 10 minutes. Remove from pan and set aside. Just before serving, put butter and 1 tablespoon olive in wide skillet over medium high heat. When butter begins to brown, add chanterelles, season with salt and pepper, and sauté for about 2 minutes, until cooked through and beginning to brown. Add garlic and parsley, stir to coat and cook 1 minute more. Add chanterelles to brown mushroom mixture and transfer to a warm serving bowl. Accompany with polenta or pasta if you wish. 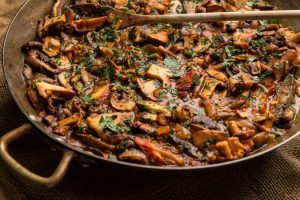 This entry was posted in entree, recipes, stew and tagged butter, garlic, main, mushrooms, olive oil, onion, parsley, red pepper flakes, rosemary, sage, stew, thyme, tomato paste, tomatoes by admin. Bookmark the permalink.